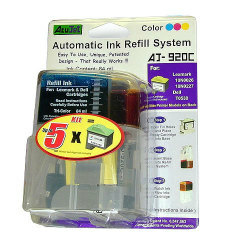 You could refill up to 5 times with this automatic ink refill system. No overflows, No messy Hands, No dripping ink. Never leave cartridge and base in ink tank overnight. DO NOT touch the gold circuits on the cartridge print head. Avoid touching the bottom of the print head. DO NOT allow cartridge to remain outside the printer for an extended period of time or it may not work. 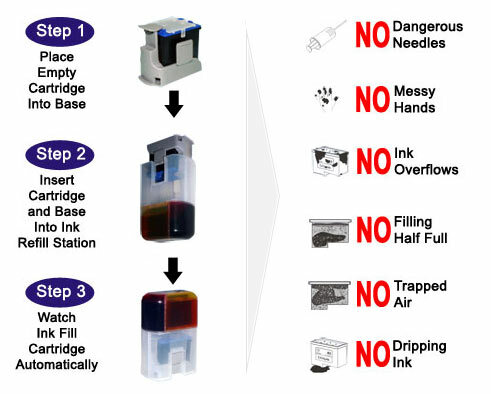 Before placing the cartridge back into the printer, make sure that ink is not dripping from the print head. If it is, place the cartridge on a newspaper (not a facial tissue) and on a washable surface, until it stops dripping. Then carefully wipe excess ink off print head with a single pass of tissue. After refilling your cartridge, the low ink indicator message may appear on your computer screen. This does not affect the cartridge usage, which has already been successfully refilled. Simply "close" the message and continue printing. Eventually, after several refills, the print quality will deteriorate and/or the cartridge will stop working properly. This is normal. At this time, a new cartridge should be purchased, which can subsequently be refilled several times more, using the patented automatic refill system.